Closed Circuit Television (CCTV) cameras are a prominent, if increasingly familiar, feature of urbanism. They symbolize the faith that spatial authorities place in technical interventions for the treatment of social problems. CCTV was principally introduced to sterilize municipalities, to govern conducts and to protect properties. Vast expenditure has been committed to these technologies without a clear sense of how precisely they influence things. 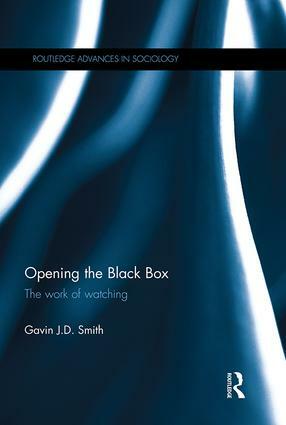 CCTV cameras might appear inanimate, but Opening the Black Box shows them to be vital mediums within relational circulations of supervision. The book principally excavates the social relations entwining the everyday application of CCTV. It takes the reader on a journey from living beneath the camera, to working behind the lens. Attention focuses on the labour exerted by camera operators as they source and process distanced spectacles. These workers are paid to scan monitor screens in search of disorderly vistas, visualizing stimuli according to its perceived riskiness and/or allurement. But the projection of this gaze can draw an unsettling reflection. It can mean enduring behavioural extremities as an impotent witness. It can also entail making spontaneous decisions that determine the course of justice. Opening the Black Box, therefore, contemplates the seductive and traumatic dimensions of monitoring telemediated ‘riskscapes’ through the prism of camera circuitry. It probes the positioning of camera operators as ‘vicarious’ custodians of a precarious social order and engages their subjective experiences. It reveals the work of watching to be an ambiguous practice: as much about managing external disturbances on the street as managing internal disruptions in the self.